Share interesting content immediately from your browser on the most important social media networks. Did you find an interesting article? Share it directly with your followers and fans and add a personal comment! Just click on the Blog2Social icon in your browser and share interesting content the moment you discover it. Save your links to share them later or share them on more social media networks, profiles, pages, or groups. 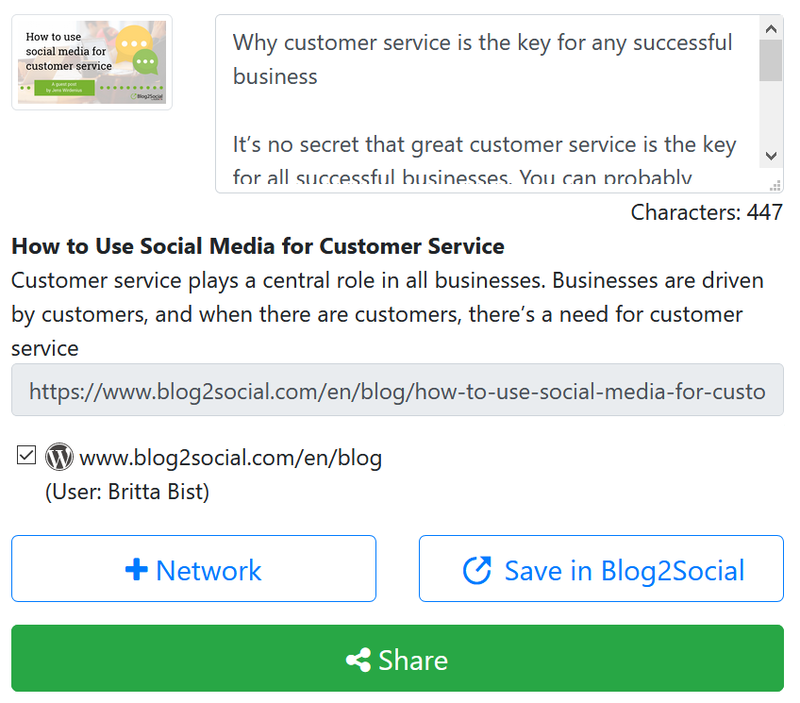 Simply save the link to the Blog2Social WebApp to customize, schedule and automatically share it on all your social media channels whenever you like.Connect the Blog2Social Browser Extension to the Blog2Social WebApp to take your social media marketing to the next level. With a Blog2Social WebApp account, you can save links while browsing and share or schedule them whenever you want. Create customized posts for each network, with personal comments, @-handles or #-hashtags. With Blog2Social you can share posts across the most important social media: Twitter, Facebook, Instagram, Google+, Pinterest, LinkedIn, Flickr, Tumblr, Torial, Medium, Bloglovin', XING, Reddit, Diigo, and Google My Business. To use the Blog2Social Browser Extension in your browser, simply download it for Google Chrome or Mozilla Firefox. Open the link to Blog2Social in the Chrome web store https://chrome.google.com/webstore/search/blog2social and click on “Add to Chrome”. Click on “Add extension” to confirm, that you want to install the Blog2Social Browser Extension. 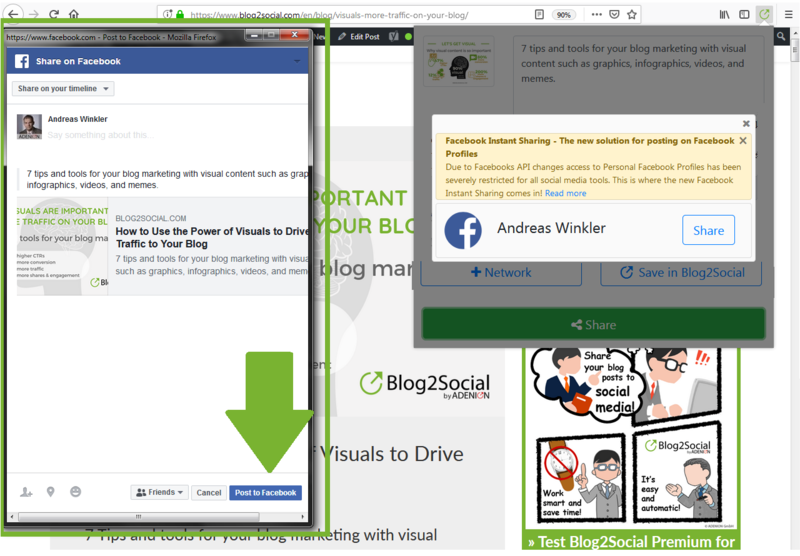 As soon as the "Blog2Social: Social Media Poster Extension" is added to your Google Chrome extensions, a notification window will appear. You can now open the extension by clicking on the little Blog2Social icon in your Google Chrome toolbar. Open the link to Blog2Social on the Firefox Addons page https://addons.mozilla.org/en-US/firefox/addon/blog2social/ and click on “+ Add to Firefox”. 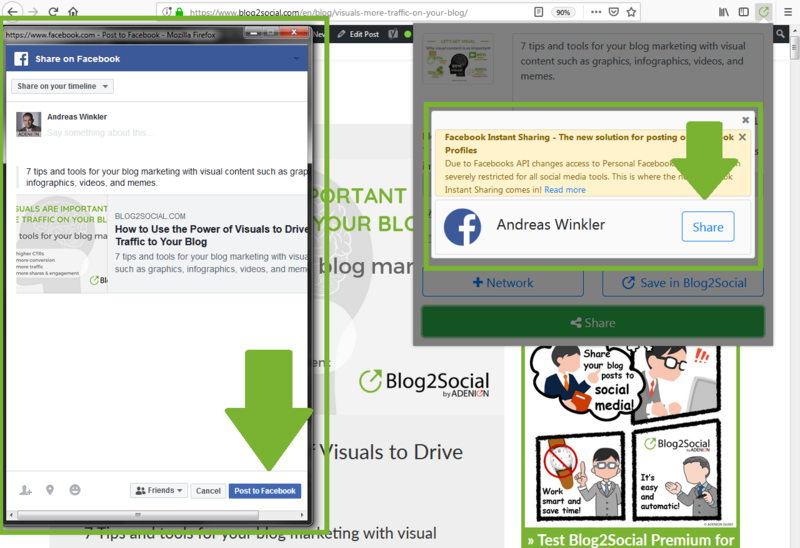 Click on “Add ” to confirm, that you want to install the Blog2Social Browser Extension. 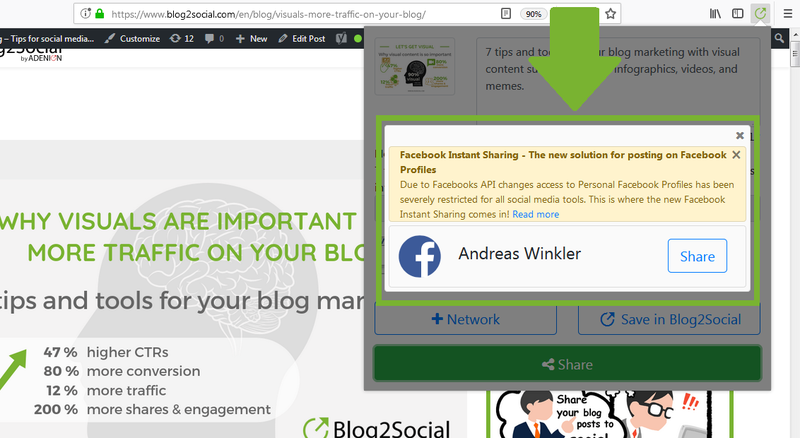 As soon as the "Blog2Social: Social Media Poster Extension" is added to your Firefox Add-ons, a notification window will appear. Click on “OK” to continue. You can now open the extension by clicking on the little Blog2Social icon in your Firefox toolbar. Connect your social media networks to share on Facebook, Twitter and LinkedIn. To do this, click on the Blog2Social icon in the toolbar of your browser. Then select the "+ Network" button. Click on "Authorize" to connect your Facebook, Twitter or LinkedIn profile to Blog2Social. To delete or change a Social Media account, click on "+Networks" and then click on the little red X next to your profile name. You can connect a new account afterward. To share a website on your social media profiles, simply click on the Blog2Social icon in your browser's toolbar. 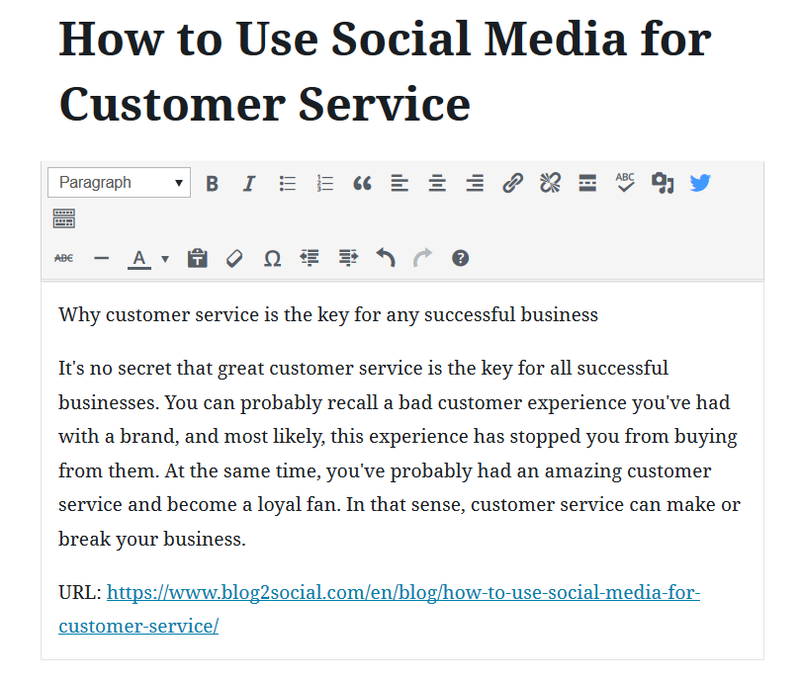 Blog2Social pulls the title, image, and description of the website and displays it a post preview. Add your own comment text to the “Content” text box to customize your social media post. Tip: Posts with individual comments perform better on social media as they give your post a personal touch or add additional information. Customized posts are perceived as valuable and informative and receive more comments, likes, and shares. 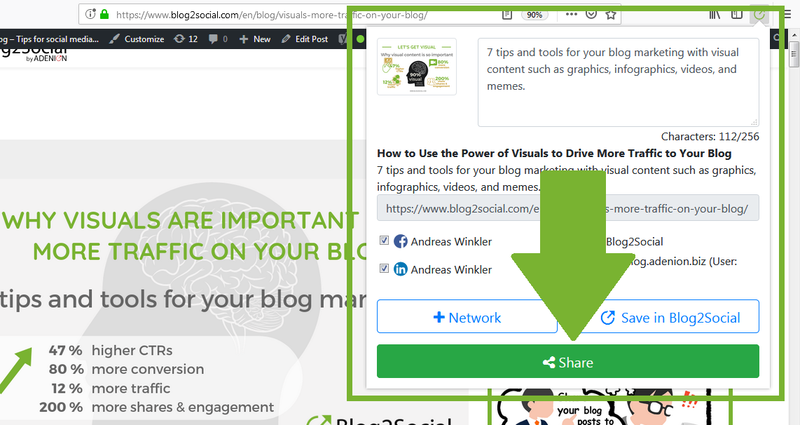 If you are happy with your post, click on the green "Share" button and your customized post will be published directly on the selected (ticked) social media accounts. If Facebook is one of your chosen networks, you will be taken to the Instant Sharing window where you can tag friends, add locations and more. You can even choose to post on a page or in a group. Select Facebook as one of your chosen networks and click on "Share". When Facebook is selected, clicking on "Share" will open another window. Click on "Share" to open the Instant Sharing window. If you are not already logged into Facebook, you will be asked to do so. If you have or manage more than one Facebook Profile, please make sure to log into the right profile before sharing. Choose where you want to share your post on in the top left section of the Instant Sharing window and customize your post. If you are happy with your Facebook post, click on “Post to Facebook” to share your post directly on your Facebook profile or chosen page, group or event. 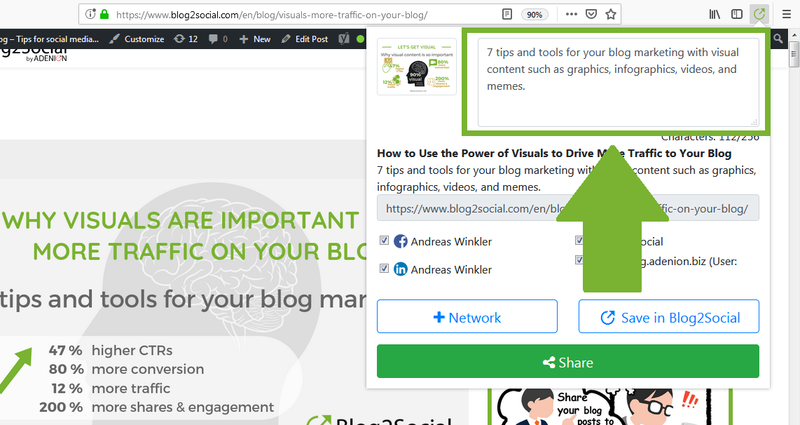 Additionally to your social media accounts, you can also connect your WordPress website to the Blog2Social Browser Plugin. To do this, click on the Blog2Social icon in the toolbar of your browser. Then select the "+ Network" button. 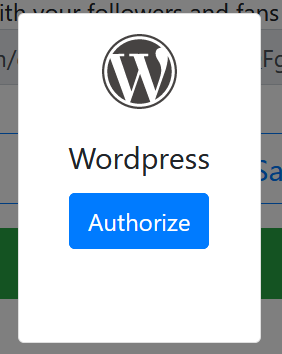 Click on “Authorize” underneath the WordPress Logo to open a new window. Insert your domain (website URL) as well as the username and password you use to log in to your WordPress backend. Click on “authorize” to authorize the connection. 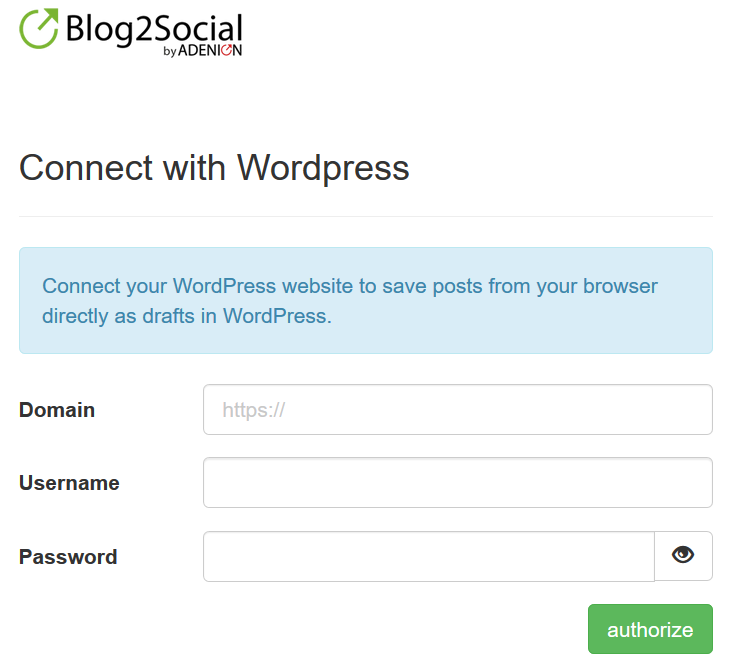 Your WordPress website is now connected to Blog2Social. After you successfully connected your WordPress website, you can select it to save an article as a draft on your blog. To do this, make sure to tick the checkbox in front of your WordPress website. Customize your draft and then click on “share” to save it directly in your WordPress. Click on “show” to directly open your draft in your WordPress blog. It will contain the Title of the Article, your customized text as well as the link to the original article you found. You can now edit and publish it in WordPress as you normally do. 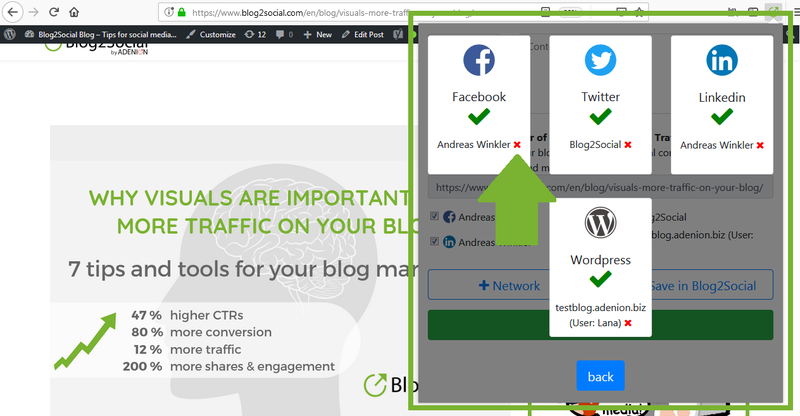 The Blog2Social Browser Extension not only lets you share interesting links or your own posts directly on your social media channels. When connected to the Blog2Social WebApp, you can also save, customize, and schedule posts for a later time. Use the Blog2Social WebApp, to share and schedule your posts on the most important social media networks. The Social Media Calendar keeps track of your planned and shared posts. The best time planner allows you to always publish your posts at the best times for each network to reach as many people as possible. 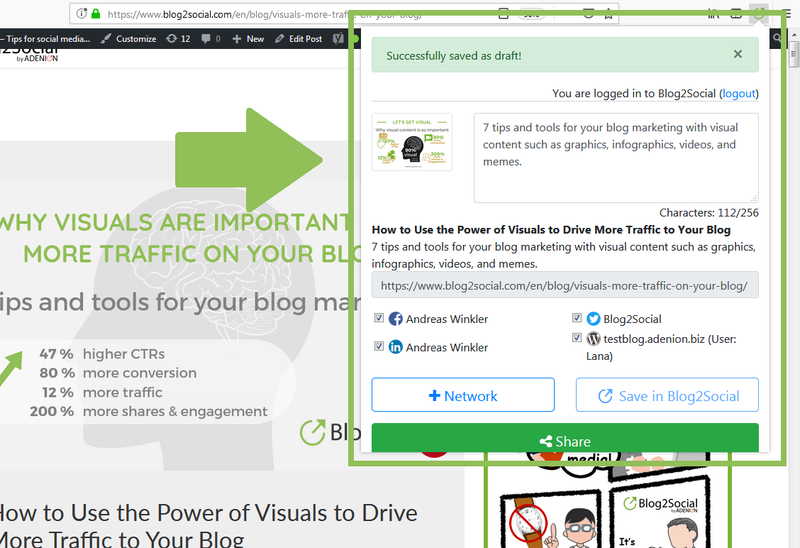 The Blog2Social WebApp automatically shares your posts in the right format for each network. You can choose individual images for different social networks and communities and choose between image and link post formats. Click on the Blog2Social icon in your browser and then click "Save in Blog2Social" to save the website you are currently visiting as a social media post draft in the Blog2Social WebApp. 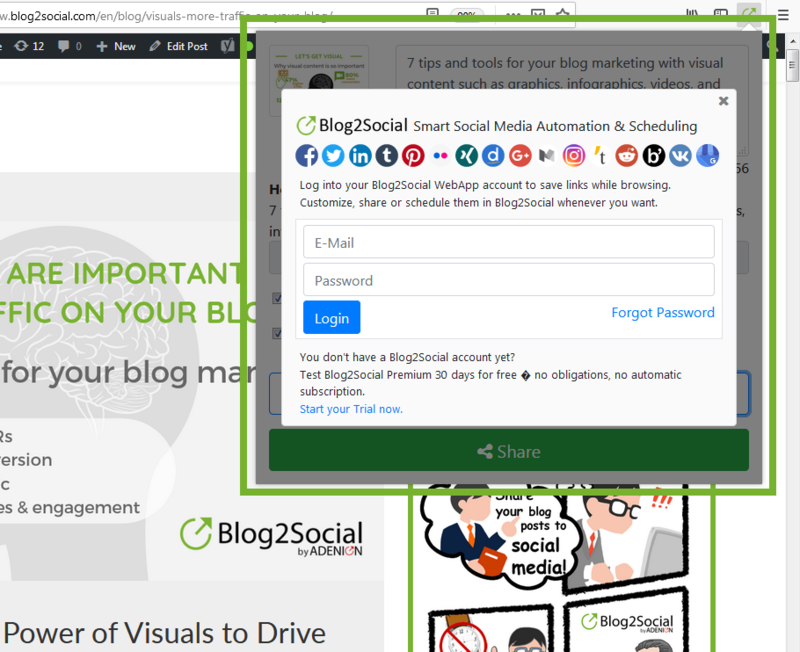 If you are not yet logged in, Blog2Social will ask you to log in with your Blog2Social WebApp account or to sign up for a free 30-day trial. Afterward, you will receive the message "Successfully saved as draft!". To share your saved posts, log into your Blog2Social WebApp account on app.blog2social.com. Click on "Manage Posts" and "Drafts". Select your draft by clicking on "edit draft". If you have not yet connected your social media networks in the Blog2Social WebApp, please do so by clicking on "add network" on the right side. You can now customize your post and either share it immediately or schedule it for a later date. Test the Blog2Social WebApp Premium version 30 days for free and test all the advanced features of the premium version. 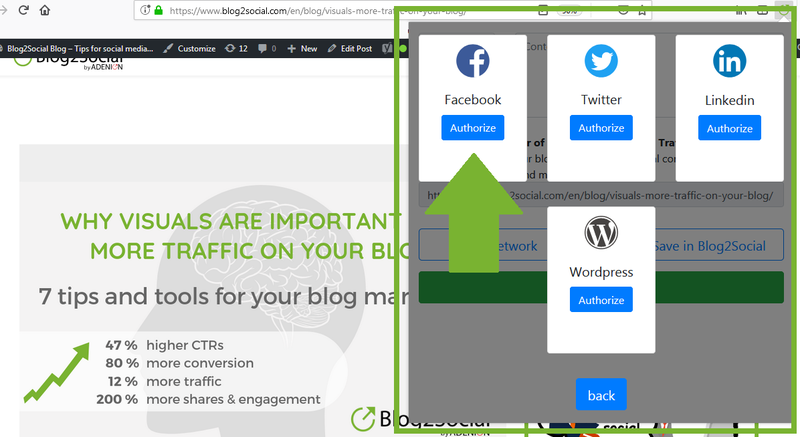 Afterward, you can decide whether you want to keep using the Blog2Social WebApp premium version and share your content on the most important social media networks or choose the free version to publish your posts on three social media networks of your choice. Where does Blog2Social save my personal data, passwords and usernames?